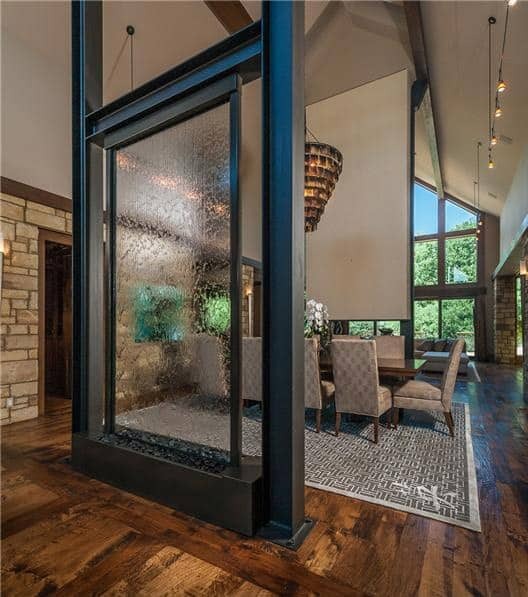 This gallery feature gorgeous indoor water fountains and waterfalls that can enhance any room in the house. They offer the tranquility of the soft trickling sound of water, along with gentle mood lighting to drama to a space, and the natural beauty of flowing water. 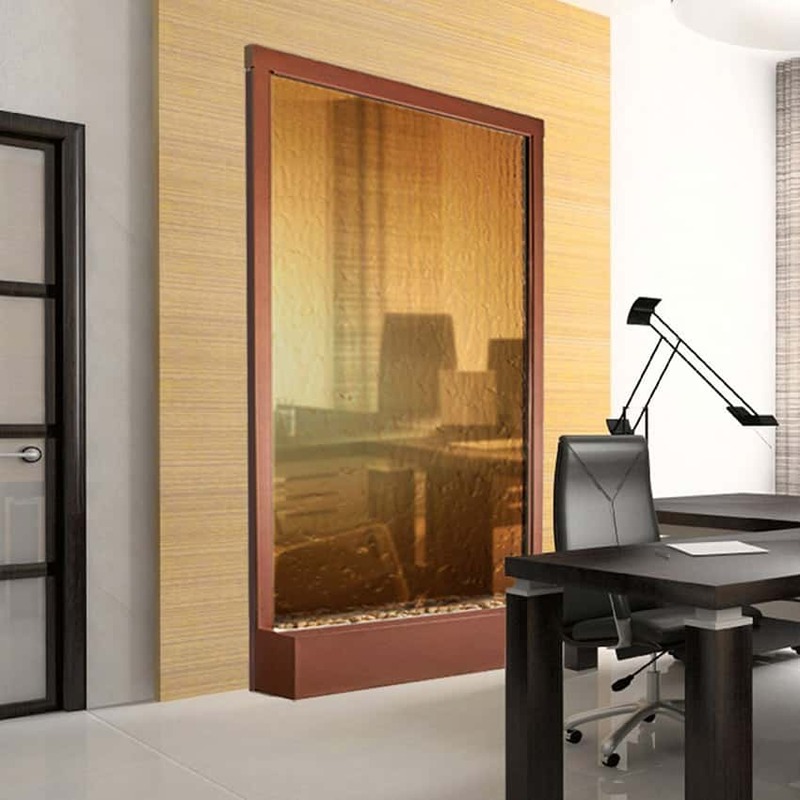 In the picture above is a large transparent waterfall that acts as both a dramatic backdrop and room divider. 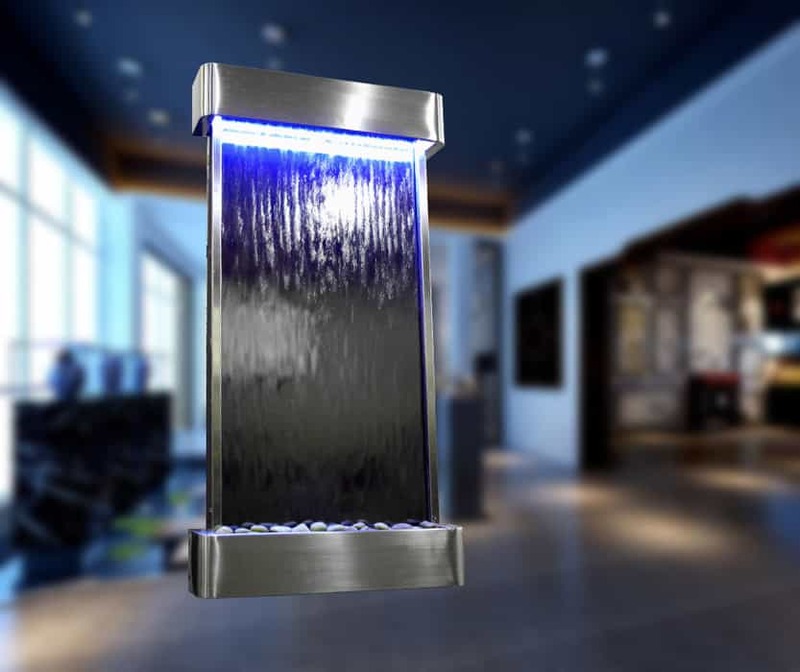 The indoor waterfall is created by Humidifall Transparent Waterfall Systems. 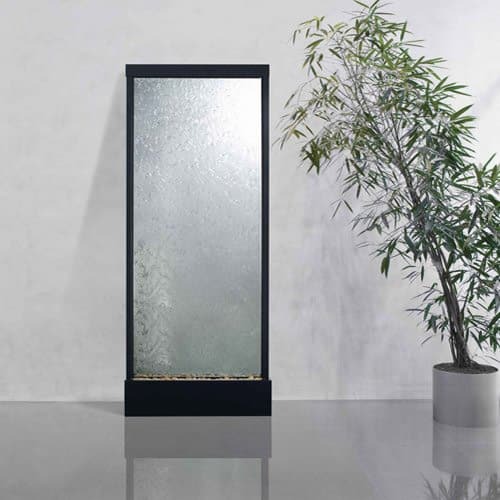 They offer five different sizes of fountain with clear transparent or decorative glass panels. A stylish wall mounted water fountain with blue LED lighting, brushed aluminum frame and small river stones displayed in the base. Photo credit: Red Monkey King. 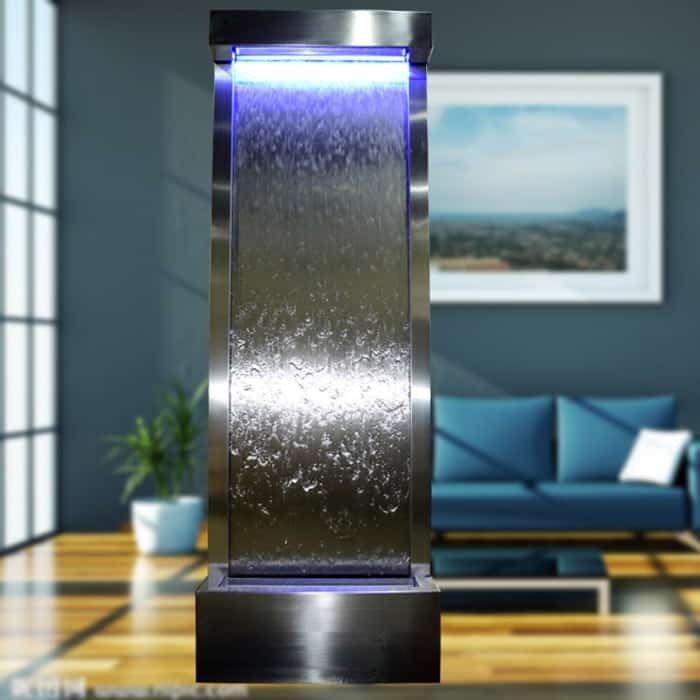 This wall mounted waterfall fountain by Red Monkey King has a blue mirror surface and aluminum frame.To learn more about this blue surface hanging wall fountain visit Red Monkey King. 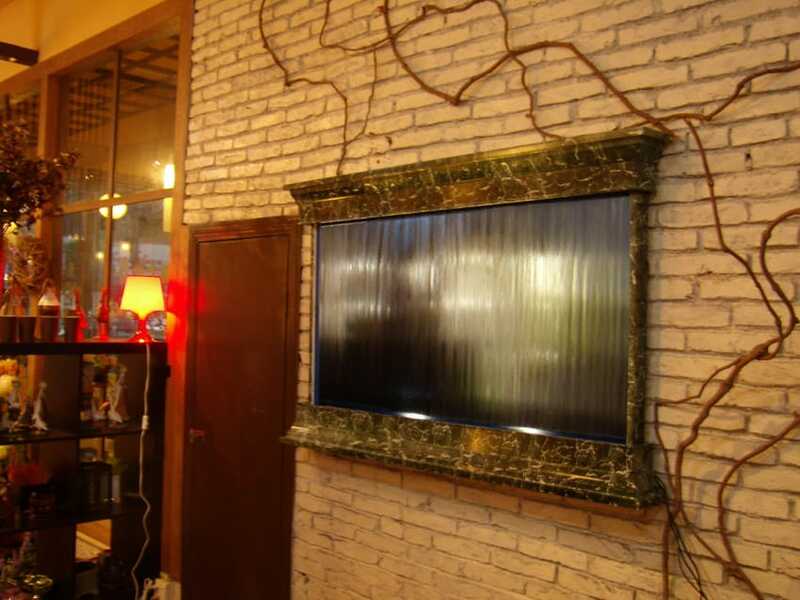 This is a different angle of the wall mounted indoor waterfall fountain shown above. 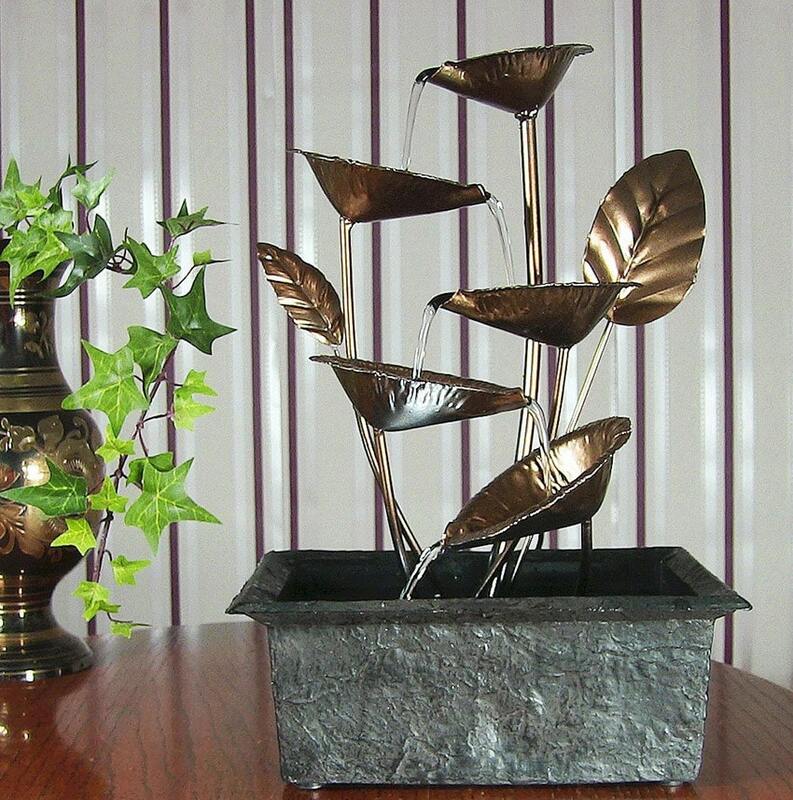 This tabletop fountain is called the wandering leaves and is a great size for display. 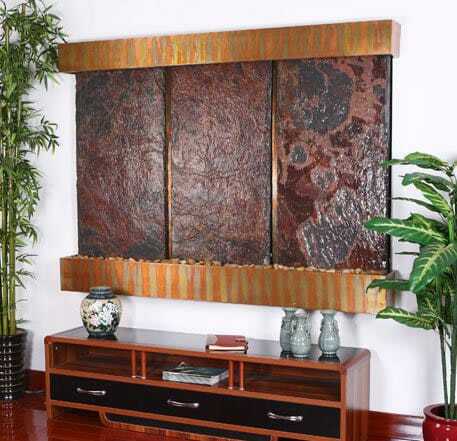 With a copper style and trellis back, the fountain provides a zen like centerpiece for your room. The fountain has decorative river rocks to capture the water before it is recirculated through the pump back to the top of the unit. LED lighting provides illumination to help enhance the appearance. Find out more about the Wandering Leaves Tabletop Fountain here. 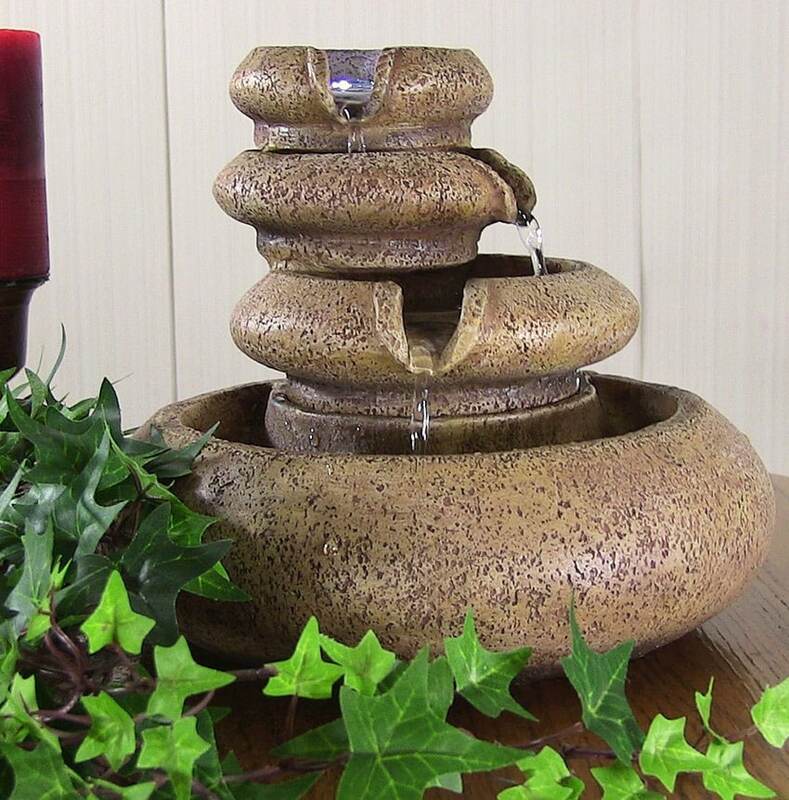 This three tiered tabletop fountain is a great way to spice up the decor of your room. It is only 8 inches tall but it is sure to add style and calm to your space. It comes with built in LED lights for illuminating the water as it flows down the sides of the fountain. It is also whisper quiet which is great for those who want an indoor fountain without an additional water flow noise. Get more information about the Three Tier Tabletop Fountain here. 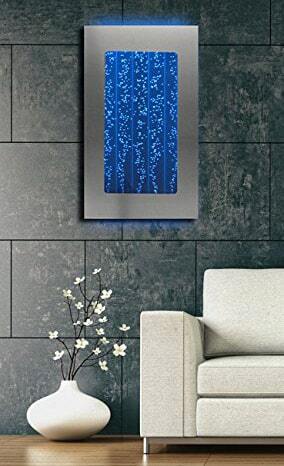 This wall mounted bubble wall aquarium waterfall fountain creates a relaxing environment with its back-lit led lighting that can change with the push of a button. 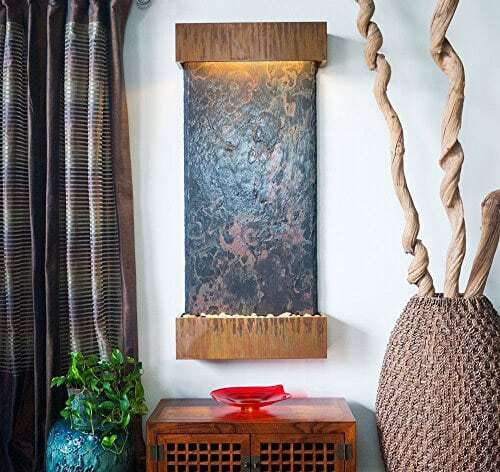 The illuminated bubbles of this fountain can be controlled to create the perfect zen like state you desire in your room. Get more details about the Indoor Bubble Fountain here. This bronze indoor floor fountain has a mirror like surface that glimmers as water softly flows from the top to recirculate in the pump expertly hidden beneath river rocks in its base. 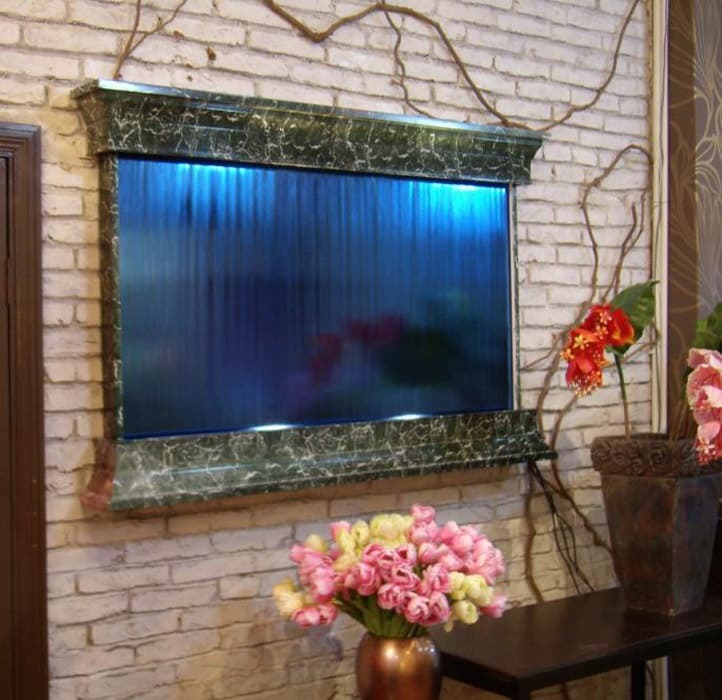 The frame of the fountain is metal with a copper vein powder coated finish to bring an elegant look to your space. Read more about the large Copper Indoor Waterfall Fountain here. 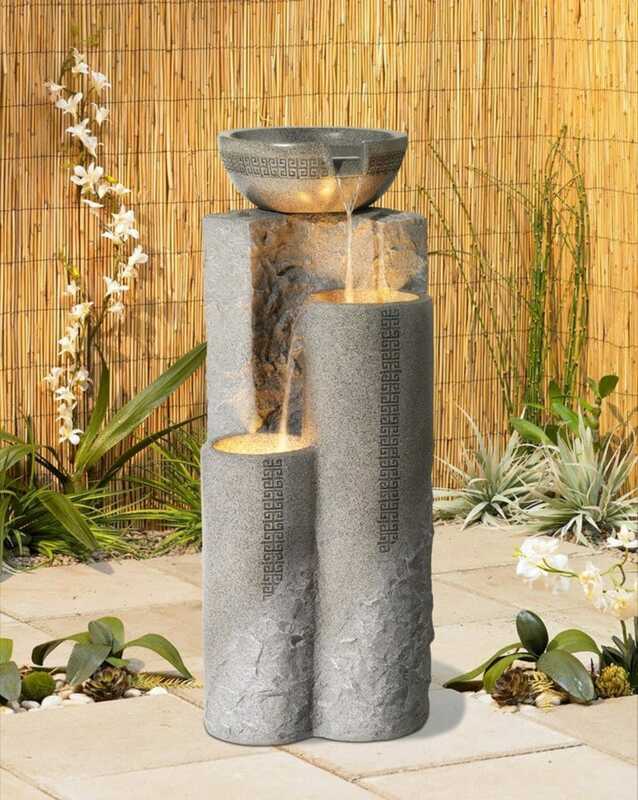 Bring a sense of romance in to your home with this illuminated faux marble pillar fountain. Featuring a marble stle bowl at the top which pours water down in to two other pillars creating a soothing sound and relaxing vibe. The fountain is designed to be used indoor or outdoor and is lightweight and easy to move. Get more information about the Marble Pillar Fountain here. 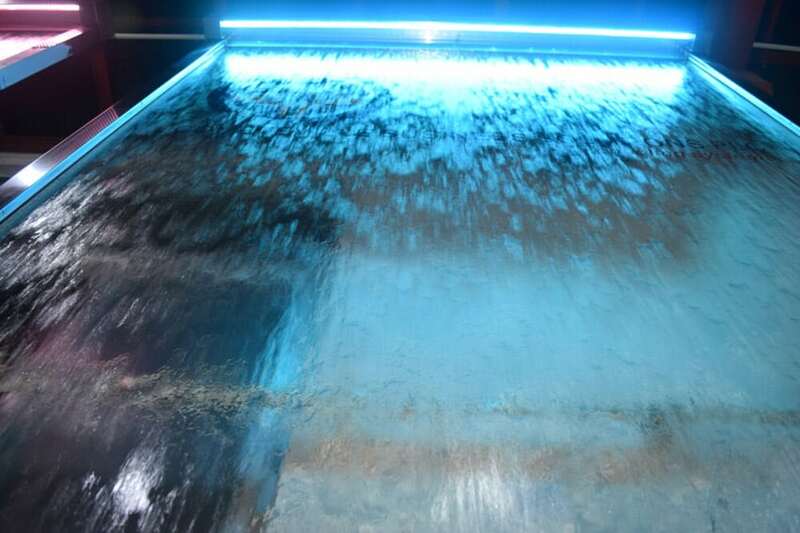 This beautiful indoor waterfall is constructed from tempered glass that allows the water to cascade down to river rocks creating a relaxing babbling sound effect. the fountain has an metal frame with powder coat finish that is modern looking and attractive. 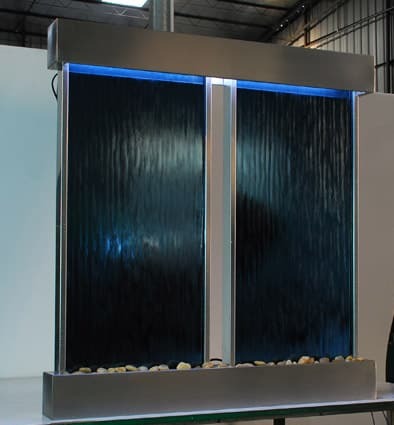 Get more information about the Indoor Waterfall Floor Fountain here. 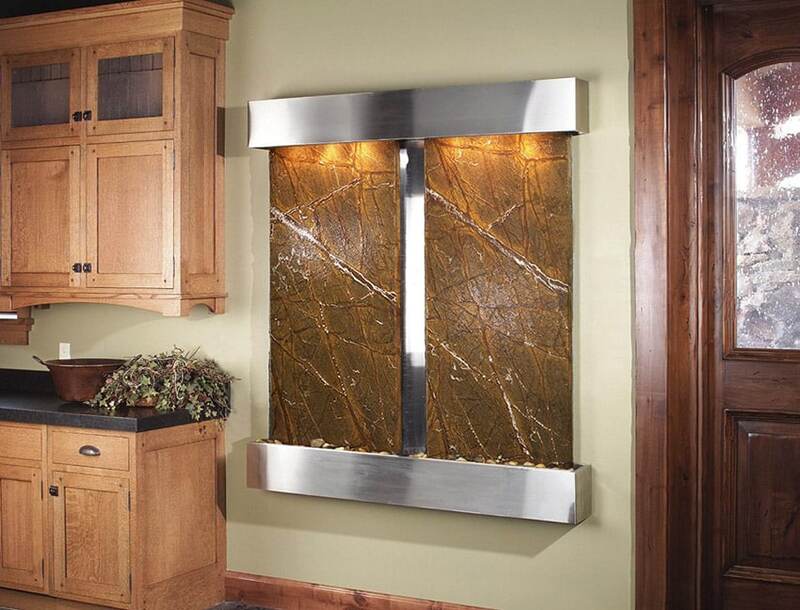 This vertical wall mounted water feature has a polished stainless steel frame with marble fountain faces and halogen lights for illuminating the flow of water. 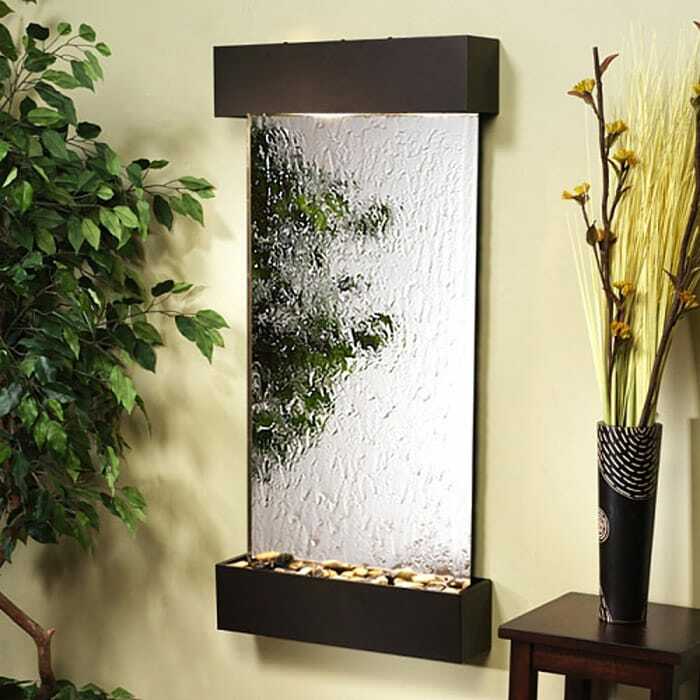 The vertical water feature comes complete with dimmer switch to control the mood. 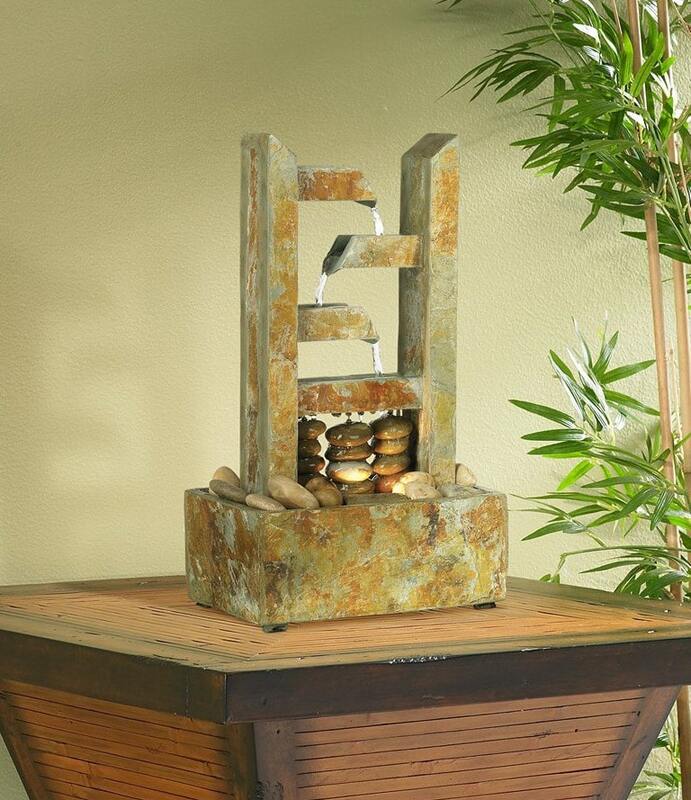 This fountain design is available in a rustic copper, dark copper, or Stainless Steel frame. In addition the fountain comes in the following surfaces, Marble, Featherstone, Mirror, or Natural Slate. Read more about the Marble Indoor Fountain here. 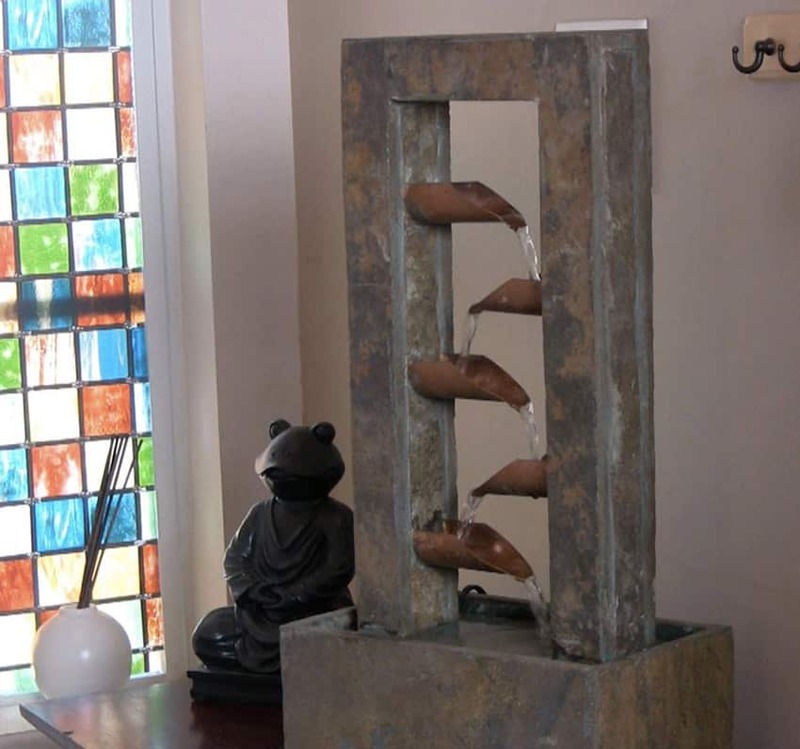 This wall mounted triple fountain features a thin layer of hand chipped slate with a copper patina frame. War led lighting gives the wall fountain an alluring glow while the water flows in to polished river rocks providing the soothing sound water. Learn more about the Triple Nojoqui Falls Fountain here. The wall mounted Nojoqui Falls fountain has a copper patina with natural stone looking backdrop that is lite by led lights. Perfect for the living room or office with its own remote control. Learn more about the Nojoqui Falls Wall Fountain here. 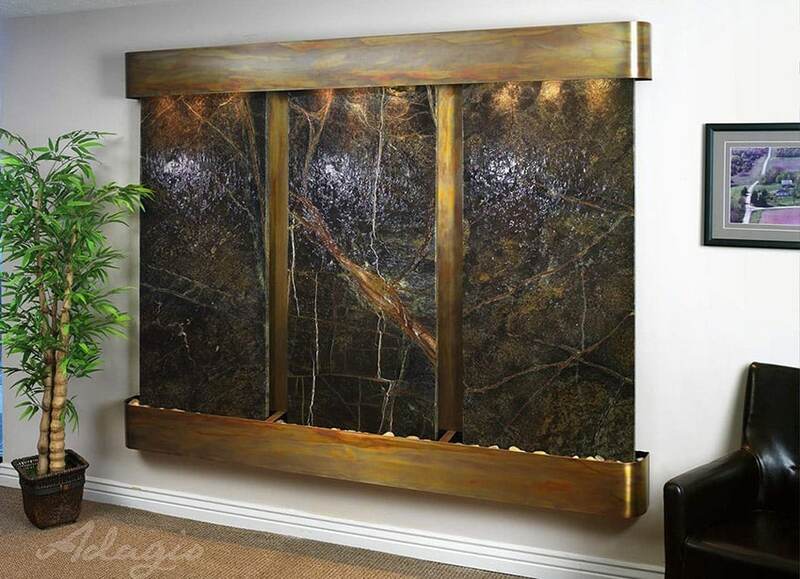 This wall mounted marble fountain has three separate marble slabs surround by a rustic copper finish frame. Soft lighting illuminates the water as it flows down the surface of the waterfall fountain in to the river rocks in its base. the lighting combined with the soft flow of water creates a comforting and tranquil environment. Read more about the Rainforest Waterfall Fountain here. This five leaves tabletop fountain can help create a relaxing environment with its metal leaves that slowly pours water from leaf to leaf. The fountain is painted in a brass color with a resin base and it comes equipped with an LED light for night time illumination or daytime enhancement of the water flow. The quiet trickle design of this fountain means you will hear little water noise. Find out more about the Five Leaves Water Fountain here. 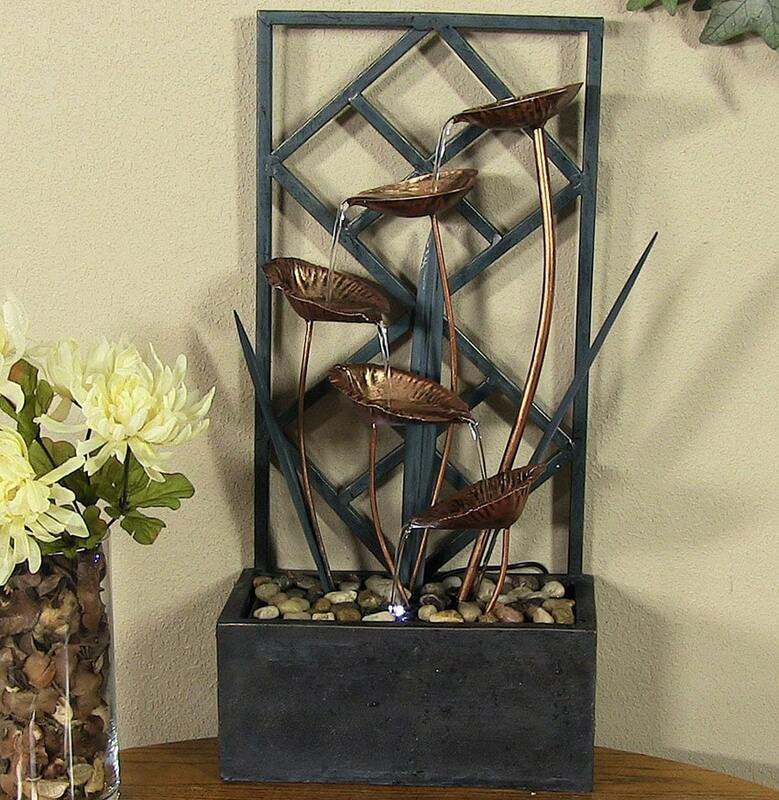 This natural slate table fountain is 19 inches tall and features little copper spouts that pour water in to each other creating a tranquil setting. The water flows from the copper spouts in to river stones at its base. The fountain provides a pleasant soothing sound when in use that is quiet and soothing. Get more details about the Indoor Slate Fountain here. This soothing water fountain is perfect for the tabletop at only 13 inches wide and 13 inches deep. It has a rippled design the spills water down its surface to the rocks below. a light is positioned above the fountain to highlight the waterflow. 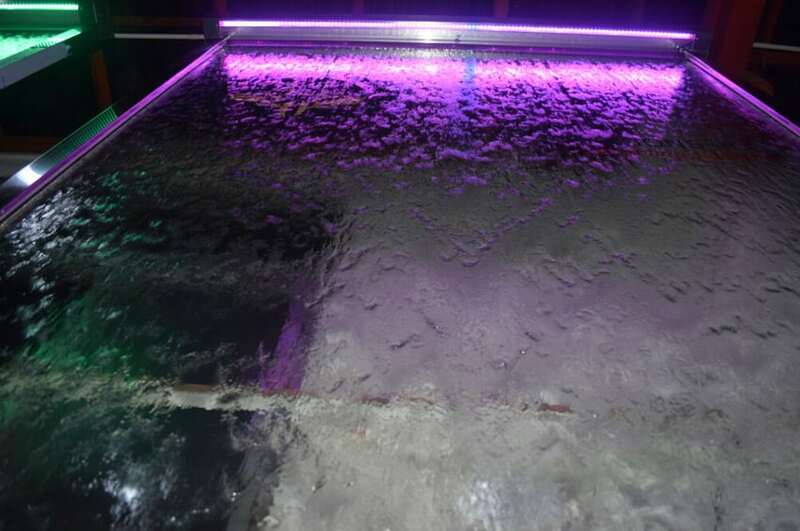 Read more about the water ripple table fountain here. 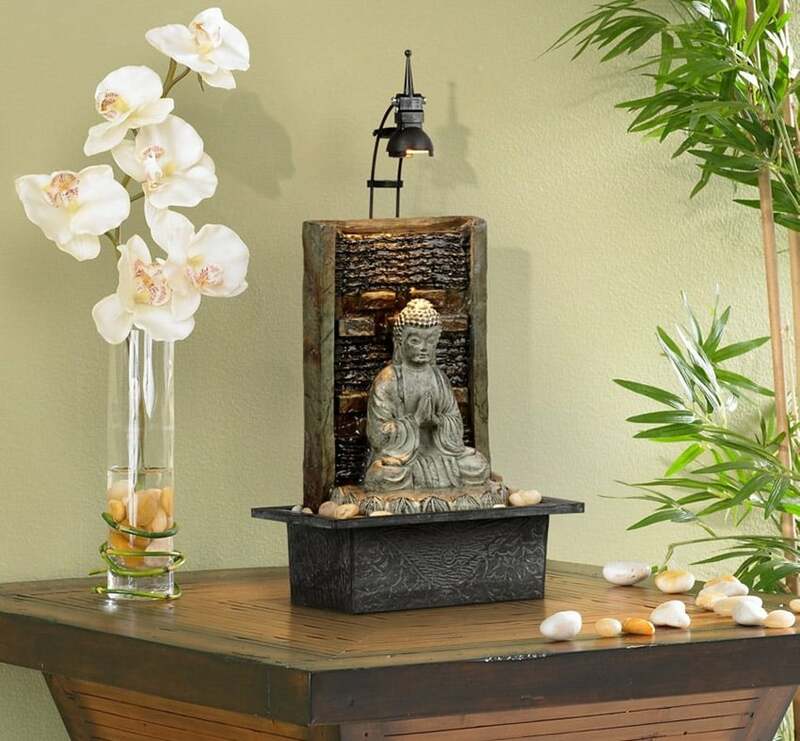 This peaceful statue fountain called the “Namaste Buddha” is 11 1/2 inches tall. The fountain features an illuminated Buddha sitting on river rocks while water trickles from behind. Learn more about the statue fountain here. 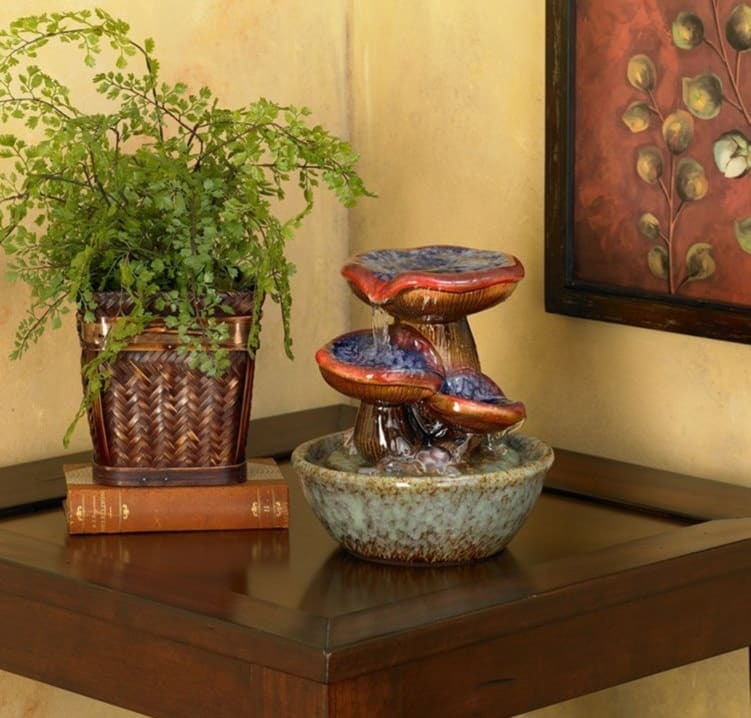 This small tabletop toadstool design water fountain makes an attractive desk or table accessory. It stands 9 1/4 inches high and 8 inches wide and is constructed out of glazed ceramic with three toadstool levels from where water can flow down in to the base. Get more information about the Toadstool fountain here. The ZigZag water fountain is created of natural slate with a design that lets the water flow down from spout to spout creating a soothing trickling water sound. 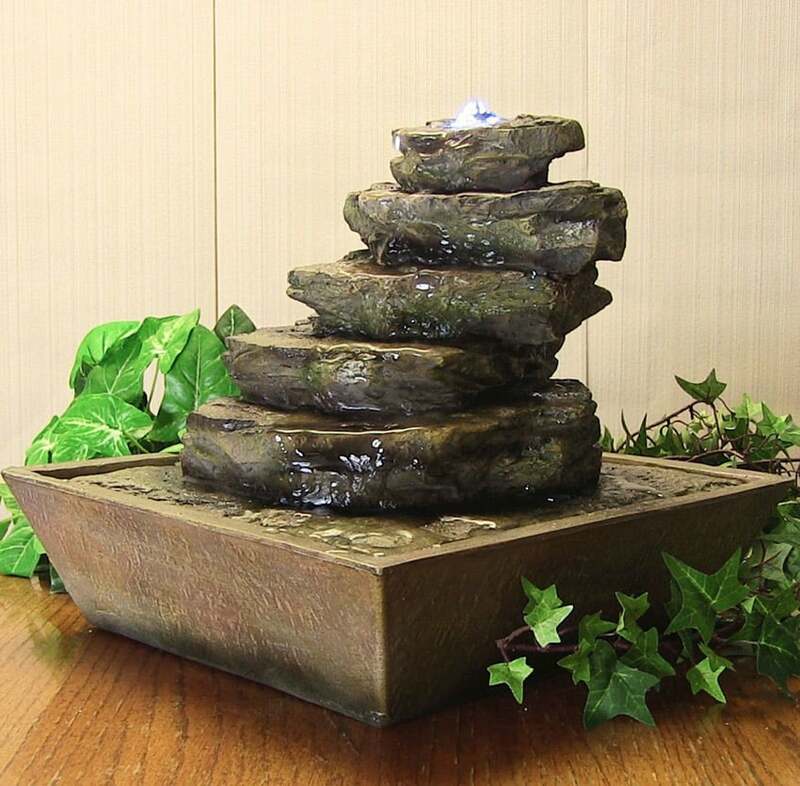 The 17 1/4 inch high table fountain is a great show piece for a room or office. Get more details about the ZigZag fountain here. Enjoy the bubbling water sounds of your own indoor water fountain featuring cascading rocks that create a mini waterfall effect. 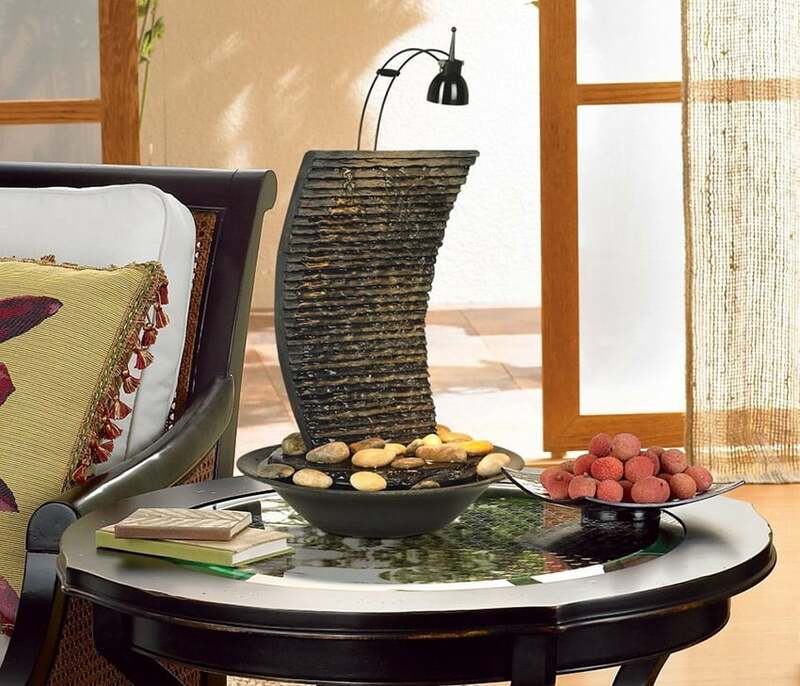 The natural style of this indoor fountain is constructed from polyresin material made to look like real stacked stones. Get more details about the Cascading Rock Fountain here.